Welcome to the world of Antharra! Thousands of Parsecs from our Solar system and Milky Way galaxy, lies medium sized spiral galaxy of Antharra. Its distinctive shape is easily recognized, and it’s envelope (outer disc ) is just over 25,000 Parsecs wide, while the central core, galaxy hub is somewhat small, around 1,500 Parsecs. Central condensation of the galaxy is very large, considering the size of outer rim and spiral arms. Some of tails aren’t fully formed, and stretch long out from the margins of the galaxy, making them blend into background of the universe. So far, Antharrians had uncovered only 2,500 Parsecs of Enhomial Tail, one of three tails of South-West edge of the galaxy. Numerous expeditions are sent into new, undiscovered parts of the Enhomial Tail, and we are yet to hear from them. Brightest star of this region is Kundar, green giant. It is home for several species, Menosarh, Undegron, Elon and Ganary. But, we will go back to these species a bit later. Overall, there is around 70 civilizations that thrive all over Enhomial Tail and they are mostly socially engaged between themselves. However, some civilizations love to stick to themselves, and some are very, very hostile toward all other races, and we will go through all of them. Some civilizations made alliances, and four most powerful are Fedagnat, Neur’htal, Abain and Dra’alzin. Few civilizations are very old, over 10,000 Artade’s ( Artade is universal measure for time, around 2 and a half Earth years ) and they are first to discover Inner Dimensions, space within our space, which expanded the mind and the science in Antharra. Inner Dimensions are many, and they are physical realms which are interconnected with “our” realm, called Yawy. So far, there is seven Inner Dimensions, and still searching for more. None of these seven realms are fully uncovered, and many mysteries are still baffling scientists and Biallons ( scientists of unnatural ). Still, many features from those realms helped Antharrians in their history and many new civilizations and races are found. Some of them do not have physical appearances, and some of them need special coating to reside in Antharra realm, Yawy. Throughout history, few civilizations stand out, and we will go through them first. 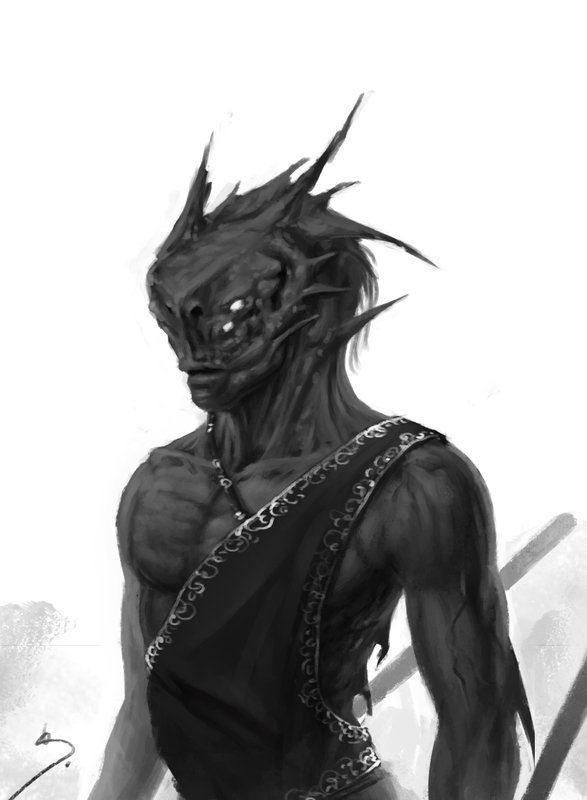 First of them are Gen Odos, humanoid race from Arg Hatu solar system, with Ondan as planet of origin. One of the oldest civilizations, invented Genasa, language which is common through almost all corners of known Enhomial Tail. Some races, due to physical inability to speak Genasa, have their own iterations of it. On other hand, some use telepathy, some light and others use mime, smell or touch. There is numerous other languages, which will we go through on this journey. Gen Odos also invented universal Antharrian time, Artades and Oens, and it starts measuring time at the moment when Gen Odos and Undegron civilizations first came in contact and confirm life on other planets. Both civilizations were somewhat old, around 2,500 and 3,500 Artades, and made Fedagnat Alliance. This is also the time where we will start our journey through it, all up’s and down’s. After 15 years of making, Adam Isailovic presents Project: Antharra, and it will be updated weekly on FB and DeviantArt pages! Project involves vast world of Antharra galaxy, and it’s inhabitants. Comic book announcement coming soon!